Spectral Dynamics (SD) is a technically innovative company that has served the Satellite and Space Testing and Analysis community continuously since 1961. 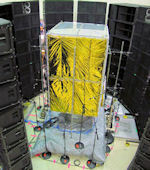 Whether it is challenging MIMO or MISO vibration tests, innovative Direct Field Acoustic Testing, unique Shock testing to 2.5 Mhz, or accurate 40 KHz BW Phase-locked acquisition of hundreds of channels of data, Spectral Dynamics effectively reduces the total costs of dynamic testing. Spectral Dynamics now also offers complete solutions for excitation with all sizes of shaker systems from small modal shakers to monster water cooled shakers. These shakers can be configured for single axis, multiple shaker single axis, and multiple shaker multiple axes for 3 DOF and 6 DOF testing, i.e. MILSTD 810G. At the Space Simulation Conference we will be showing the very latest in Data Acquisition, Shaker Control, and Modal Analysis including our new BOBCAT, ruggedized, compact Analyzer. Call Spectral Dynamics for a customized solution to your needs in Vibration, Shock or Acoustic Test Control; Multi-Channel Data Acquisition; Modal Analysis or PIND Testing. We will help you craft a technically correct, affordable, solution.